On Scene: The First Twenty: get healthy, get fit, stay safe. The First Twenty: get healthy, get fit, stay safe. It probably won't surprise you that the #1 New Years Resolution is to Lose Weight, year after year it tops the chart. It's important to take health seriously and as a firefighter, even more so with the line of duty you're in. Firefighters are at risk of death if their health isn't kept a priority. The statistics are alarming and you can read more about that here. This is where The First Twenty comes in. 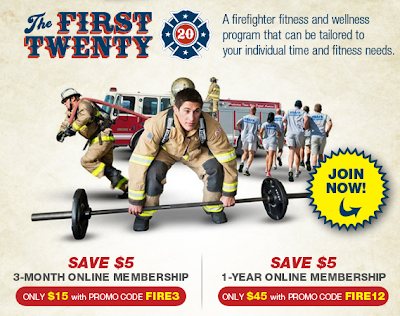 The First Twenty is a non-profit dedicated to the health of firefighters. TheFireStore teamed up with The First Twenty for this awesome deal to sign up for the program they designed specifically for you to get healthy and stay healthy. According to their website, this program is "a fitness and wellness system that will reach, educate, train and motivate our firefighters. Our portable, scalable program is designed to be easily managed, maintained and implemented by the average firefighter." Check out all the information on how to join and use your Exclusive Promo Codes to get a great deal on the start to a new, healthy life that's priceless. Your health is nothing to mess with. Be the best, healthiest you.